Gossimer, one of the top 25 most famous web hosting companies of the world, has decided to end 2010 with a big bang. The company has announced a never-before domain transfer-in promotion that will run precisely for 24 hrs. Gossimer, one of the top 25 most famous web hosting companies, is bidding farewell to 2010 with what could be called the hottest domain transfer-in promotion of the year. 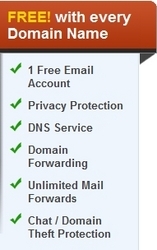 Under this promotion a web master can transfer any number of .COM, .NET, .ORG, .INFO, .EU, and .US domains by paying a mere sum of $0.99. Under this promotion, Gossimer will be adding one year to the domain registration of every domain transferred in from other domain registrar. The promotion will start on 00:01 hrs. (EST), December 31, 2010 and run till the midnight 00:00 hrs. (EST), January 01, 2011. The special pricing will be applicable to the first 10,000 transferred-in domains only, once the 10,000 mark is reached the promotion will end even if it is within the first few hours of the promotion. To be eligible for the special pricing a web master need not complete the transfer on December 31, 2010. All he has to do is to order the transfer and pay the invoice during the promotion period stated above. Orders with unpaid invoices will not be eligible for the promotion. 2010 has been a particularly happening year for Gossimer. In the very beginning, the company has moved its base from New Jersey to Melbourne, Florida. Working on 3S principle (Secure, Stable, and Swift) of web hosting, of late, the company has installed a seven-layer security system on its servers to protect all the web hosting accounts and domain names from malicious attacks. Gossimer has fortified its datacenter, network, host, software, application, personal, and audit processes. While devising the security system, the company has also factored in human errors. 2010 was quite an exciting year for the web hosting and domain name registration industry. Seeing the developing train, it does not take a genius to understand where it will head in 2011. Gossimer seems quite geared up for the challenge. Its good bye for 2010 and welcome to the bright and sunny 2011. Gossimer wishes a Happy New Year to you all!